The Bosch Isio Cordless Shrub/ Grass Shear, made by Bosch, is a lightweight cordless hedge trimmer that might just be the right one for you. This hedge cutter is one of amazon 2016 best sellers products in hedge trimmers category. It features a 3.6V lithium-ion battery, which makes it perfect for anyone that doesn’t like to deal with the hassle of cords and petrol. 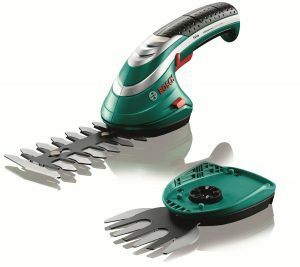 Bosch Isio shrub and grass shear is lightweight and easy to handle. It is the best cordless hedge trimmer for shaping and edging. The soft grip and weight of just 550 grams that’s about the same weight as a mug of tea comes with two plates, ensures flawless and comfortable use. You will be able to angle and cut precisely as you wish without too much effort. You get a set of two blades, that are easily interchangeable for your preference of trimming.